The workshop – the last of the present season – was very well-attended and included several new members. 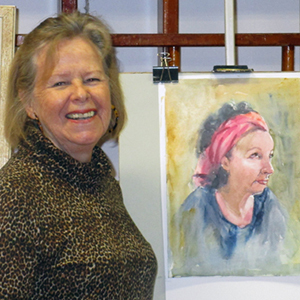 Following on from the previous evening’s demonstration, Freda was on hand to offer advice and encouragement in the creation of convincincing portraits, mainly from photographic references. The results of the afternoons labours were of a high quality, as usual, and an enjoyable and rewarding time was had by all. Freda started the evening by giving us some valuable tips for making a well-observed drawing of the human head - essential for capturing an accurate likeness. She then went on to demonstrate her method of using watercolours for portraits, including advice on paints and papers. 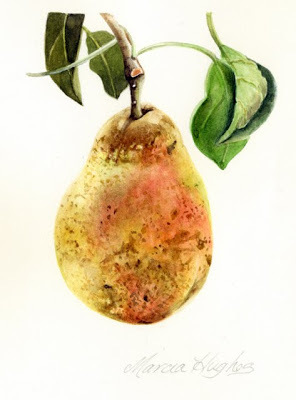 She enhances the valuable pencil drawing with some early washes and preserves any white highlights with masking fluid. Darks are then applied to establish the basic structure of the image and then the lighter skin tones are introduced in a series of transparent glazes. Layers of colour are added when the surface is dry and finally the masking fluid is removed. The result was a complete and convincing image ... all achieved with one or two well-used brushes. 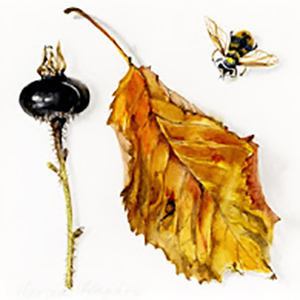 The "Fruit and Vegetables in Watercolour" workshop was run by Marcia Hughes and attracted the largest number of members this season. We were provided with a colourful array of subjects to paint and, together with Marcia's tips and guidance, this contributed to work of a very good quality. Let's see if any of them make it to the Spring Exhibition! 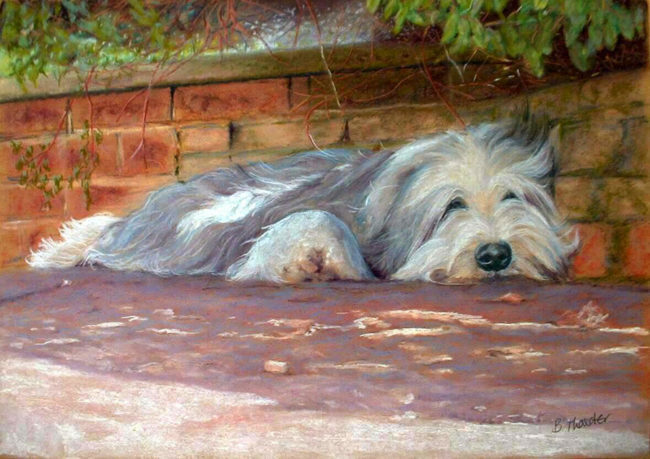 The subject of Barbara’s workshop was ‘’Pets in Pastels’’. 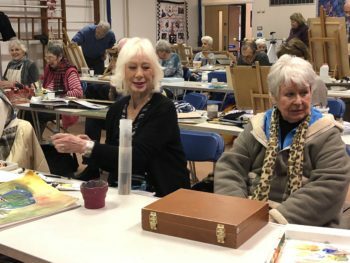 Ever generous with her advice, Barbara took us through the essential details for creating a successful pastel painting, supplying us with references, materials and ongoing guidance, and at the end of the session was very complimentary about our efforts. 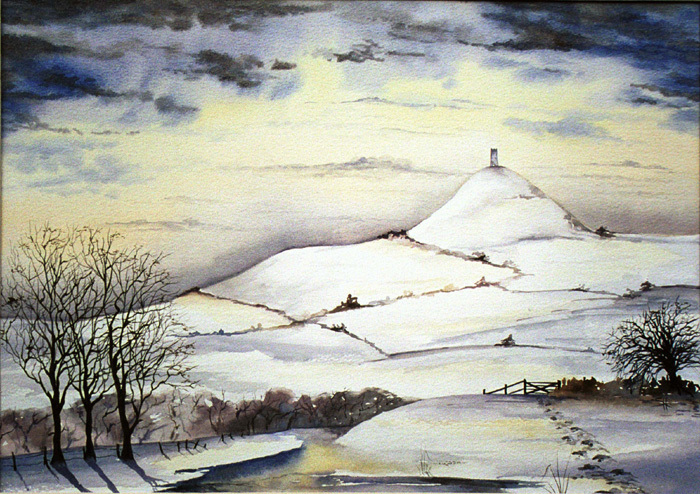 The theme of Sharon’s demo was ‘’Fantasy Landscapes’’ in watercolour. We were all treated to an outstanding evening with a witty commentary and many useful tips for members to use in the future. 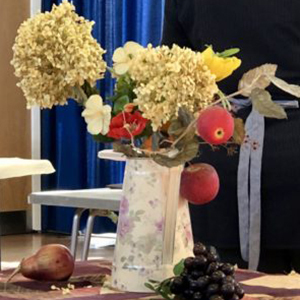 It was such a success that we have booked Sharon for a One Day Workshop in July 2020. Drawing workshop with Natasha. 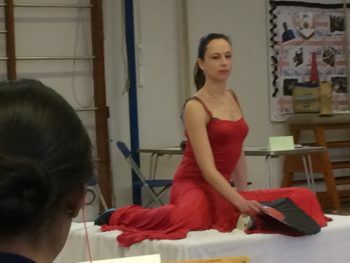 For this afternoon we had Natasha modelling for us in a variety of elegant poses with a Spanish theme. There was a selection of short studies with a longer one at the end. The afternoon was well attended. 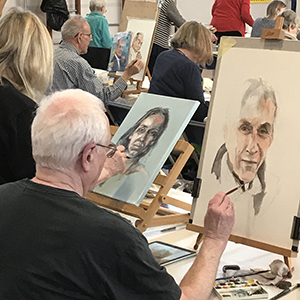 Following on from the previous nights' demo on mastering acrylics, members arrives with arms laden with acrylics and mediums, ready to try out our new painting tricks. The work created was inspiring and varied across the group. Some painted portraits and others painted scenery. Ronnie assisted us as we painted on the ground and then applied the upper coats and glazes as he had demonstrated the previous night. "Everything you want to know about acrylics but were afraid to ask". The hall was packed with members, several new members and visitors. We were all expecting an informative evening and that is exactly what we got. Ronnie listed the numerous materials available for use with acrylics and how they interact with the paint to create different effects. Then he described the colours and best paint choices when using this medium. Preparation of the various types of surfaces to paint on is fairly important but ground colour should be of a neutral tone. Ronnie also showed us how best to lay out colours on his palette. We really appreciated his ability to share his knowledge so freely and the members looked forward to the masterclass workshop the following day. This year, the Autumn Fair was held over a rainy weekend but numbers attending the event was good. 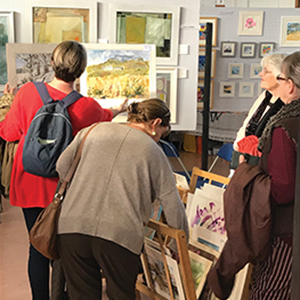 There was a sense of joy as the artists and crafters chatted to visitors and friends. 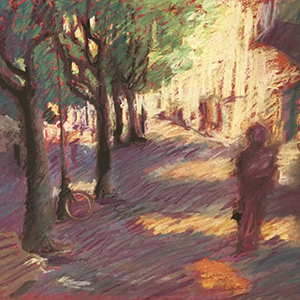 The paintings exhibited were of a consistent high standard with some new members work being exhibited for the first time. Joan Steel has led our group before and continues to draw a large crowd with her simplified method of seeing shapes. Today she showed us how she made a thumbnail sketch of the scene; checking for layout, shape and composition. She also described how she had toned her canvas. Drawing lines must not be perfect, leave something to the imagination. 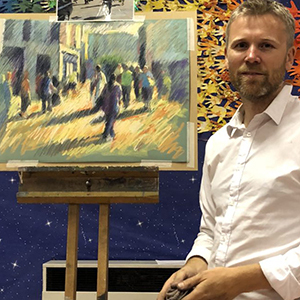 Stuart gave us an insightful demonstration regarding working with rags in oils. He described the method of painting with rags and why he had decided to pursue this medium and application method. 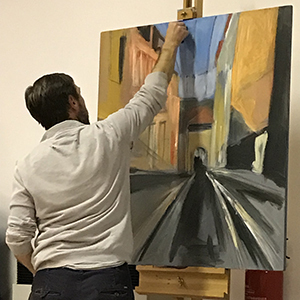 He feels a better connection to his painting when he uses his hands for a more direct style of painting. Alla Prima, is a term used in painting where the painting is done in one sitting. This means that new layers of paint are applied directly over previous layers. It is imperative that the work remains fresh and "unmuddied". To this end, he applies the first layers with beeswax and white spirits. This is then altered as the layers proceed with less and less wax being applied. The wax tends to dull the layer and this makes it recede. He starts using matt medium with his paints and this helps the layes to recede. Layers in the foreground will have a gloss medium added and this will bring them forward. The tools of his trade are palette knives, cotton rags, medium, wax and oil paints. This was a most interesting evening. Hildegarde Reid led a lively group in their efforts today. Still life set ups lay on a central island and the group chose which still life they would like to paint. We learnt how to lay in the darks after toning our canvas. Then the lights were added. We were encouraged to choose lively colours and we were assisted with colour mixing, mark making and general tips on working in oils. 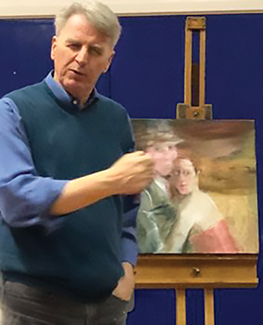 This was an excellent workshop with so many different styles of painting emerging. Some members, had a first time experience with oil painting and they were most excited to try it again. 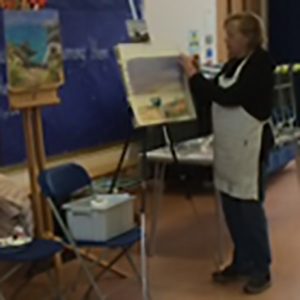 Following on from last night’s demonstration, Freda Anderson guided the workshop through the processes she applies to achieve a coastal scene in acrylics. Judging from the results she was very effective and , combined with what we had learned from Jim, some good work was produced. 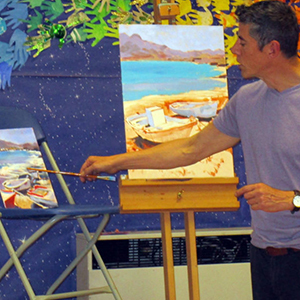 Demonstrating to the largest attendance we have had in some time, Jim Hanlon, contestant on Sky Arts Landscape Artist of the Year 2017, took us through composition, the underdrawing and then the application of colour of a Mediterranean coastal scene in acrylics. Following on from a most successful demo, Joel led us through the use of pastels first hand. 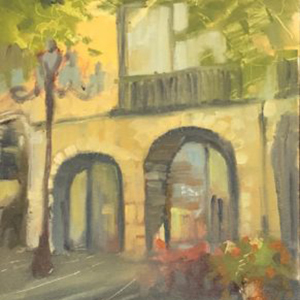 What a wonderful workshop where many members tried pastel painting for the first time! And what a splendid job they did. Thank you Joel for guiding us in our use of painting with these wonderful mediums. 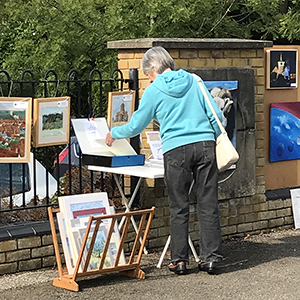 Our Towpath Exhibition fell again on the Bank Holiday weekend. Due to inclement weather predictions for the Sunday, we decided to start the exhibition on the Saturday. We were very happy to welcome viewers to our exhibition and it turned out to be an exciting and wonderful couple of days. Our AGM was held at Mole Hall in West Molesey. The room was packed with fully attentive members. Our chairman, Colin Kyte, led the meeting with a comprehensive report back to the members. A copy of this report is available from the secretary. Colin thanked the committee members for their support and hard work in the past year. 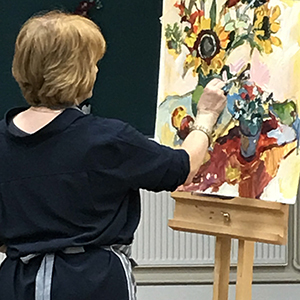 Prize winners were announced, certificates awarded and then the members adjourned to the next door room for the long awaited demonstration by Hildegarde Reid.